It was on this day in 1996 that the Chicago Bulls set an NBA record with their 70th win of the season. The Bulls broke the record previously held by the 1971-72 Los Angeles Lakers, who went 69-13. As for Chicago, they finished the season with a 72-10 record. 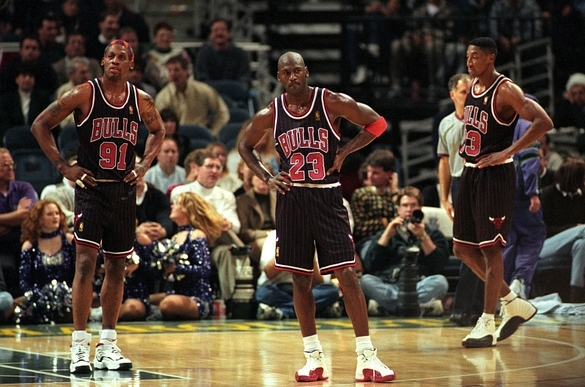 Including the playoffs, the Bulls won an incredible 87 of 100 games, led by Michael Jordan, Scottie Pippen and the newly acquired Dennis Rodman. Rodman was traded in the off-season from San Antonio along with Jack Haley for center Will Perdue and cash considerations. Rodman was brought in to replace Horace Grant at power forward, and he filled in admirably, leading the league in rebounding as well as being named to the All-Defensive First Team, along with teammates Jordan and Pippen. The 1995-96 Chicago Bulls are considered by many to be the greatest team of all time. With the way they dominated as a team, as well as all the individual awards and accolades, it is hard to argue against those who say they were the best ever. Here are highlights form the 1995-96 Chicago Bulls season.